You want to place your monitors right where you need them? Then m!ka Monitor Arms are the best option you have. In fact, they are more than just an option as they offer a multitude of ways to arrange your screens. 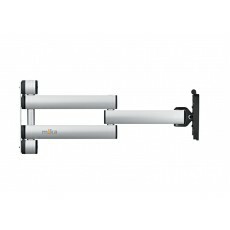 Compatible with QuickFix Adapters for VESA75 and VESA100, m!ka Monitor Arms help you to easily place one monitor in the exact place where you want it or to arrange multiple screens next to or above each other. All you need to do is to fix a few knurled screws and you're set. Individually arranging monitors has never been easier. m!ka EasyLift. Even easier height adjustable. Easily fix your Monitor Arms. With m!ka Poles. As the m!ka System's backbone, m!ka Poles hold it all. Use them to place monitor arms in your favoured position. Each Pole has four full-height grooves which are evenly distributed around it. Use them to attach up to four items at the same height of the Pole. The number of items which can be mounted on top of each other is restricted by the height of the m!ka Pole you choose. To mount a m!ka Monitor Arm simply slide it into one of the grooves and tighten its two knurled screws. To fix m!ka EasyLift Monitor Arms use a m!ka Pole Adapter. There are various m!ka Accessories to equip you with add-on options for your m!ka Monitor Arms. Choose them to make most of your m!ka arrangements. m!ka CopyStand is designed as a versatile script holder with an intelligent magnetix fixture system for your scripts. m!ka Pad-Dock securely fastens your tablet device and let's you detach it whenever you want. There are plenty of options.